There is a lot of pressure when it comes to making the right choice with the first pick in the NFL draft. We have seen our fair share of Hall of Famers, (Peyton Manning, John Elway, Lee Roy Selmon, Earl Campbell) and we’ve seen some hilarious busts (JaMarcus Russell, Courtney Brown, Ricky Bell, Ki-Jana Carter). It really can be hit or miss sometimes. Matthew Stafford is one of those first overall picks, from the 2009 edition of the draft. Stafford is by no means a bust. He has put up 21,000 yards and 131 touchdowns in his career. However, Stafford really doesn’t cut it for me. He is not number one overall material in terms of what his value turned out to be. He has been an average NFL quarterback, nothing more nothing less. There are a lot of reasons I’m not too high on Stafford as a starting NFL quarterback. It starts with his over-inflated passing stats. 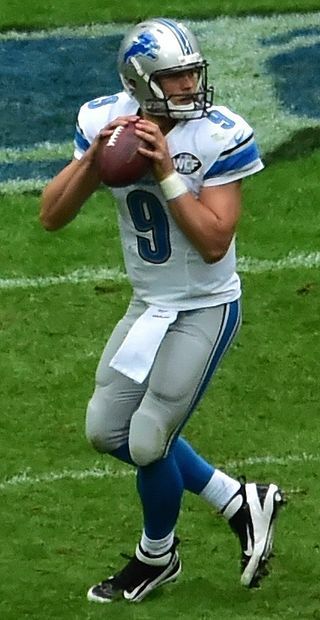 Stafford consistently throws for 4,500 yards in a season, including over 5,000 in 2011. Those numbers look great but Stafford also throws an enormous amount of passes. His career average yards per attempt sits at 7.01. Stafford has never ranked in the top ten for yards per attempt in a single season. He came close in 2012 finishing 11th. He has finished twice outside the top 20 though, including this past season. Among active starters, Stafford is tied with Joe Flacco and Andy Dalton for yards per attempt in their career at 15th. That is underwhelming for sure. That isn’t all on Stafford because his receivers are responsible for picking up yards after the catch as well. However, part of the explanation comes in the next fault in his game. 59.6 percent. That is Stafford’s career completion percentage. His receivers cannot pick up yards for him if Stafford cannot get them the ball. That number ranks Stafford 19th among active quarterbacks. That is below what would even be considered average. Stafford has only managed to rise above 60 percent twice in his four full years as the starter. This stat can be a little misleading because drops and throwaways can play a roll in driving a quarterback’s completion percentage down. Keep in mind though that Stafford doesn’t really need to be totally accurate when throwing to Calvin Johnson due to his insane catch radius. I think that balances any other factors. You would think too that with guys like Johnson and nowadays Golden Tate at his disposal, Stafford would have a ridiculous number of touchdowns. Over the last four years, Stafford has tossed on average 28 touchdowns per year, which is pretty darn good. Unfortunately, when you look at the last three seasons though, ignoring his 41 touchdown anomaly in 2011, that number drops to 23.7. That second number is a lot more middle of the pack. Over the past three years as well, Stafford has been all up and down, finishing t-20th, 6th and 14th in touchdown passes. That range brings us to the next point. Stafford lacks consistency, which is something teams desperately crave in a quarterback. Looking at this past year, Stafford toss multiple touchdowns in half of his games. At the same time, he also had four games where he failed to throw a touchdown pass. He also had five games where he threw for 300+ yards. That was juxtaposed to the three games though where Stafford failed to top 185 yards. And while you should dominate bad teams, none of Stafford’s 300+ yard days where against teams that finished in the top half of the league in pass defense and three of the teams were among the bottom five. All quarterbacks should beat up on bad teams. However, good quarterbacks need to performance against good teams as well. That is something Stafford has really struggled with. Against teams that finish the season with a winning record, Stafford is a mediocre 3-24 in the last four years. That is downright pathetic. And this has to fall mostly on Stafford’s shoulders if he really wants to be an elite quarterback. He can’t blame a sub par defense or a shoddy running game. Peyton Manning, Tom Brady, Drew Brees and Aaron Rodgers won Super Bowls with average defenses and mostly non-existent running games. It’s not easy, but it can be done. Stafford has zero playoff wins, one Pro Bowl selection (after four other quarterbacks dropped out) and is still riding the one year where he put up Pro Bowl caliber numbers, and still failed to make it. And if all of this has failed to convince you that Stafford is simply an average quarterback, maybe this will. ESPN uses the statistic Total QBR to measure a quarterback’s overall contribution to a game and weights the performance based on the number of plays and the scenario in which certain events occur. It is measured on a scale of 1-100 with 50 being average. In his six total NFL seasons, Stafford has finished each year with a rating below 61, including this season when he posted a 53.5. That was worse than Jay Cutler rated. The same guy who was benched toward the end of the season due to his poor play. Plain and simple, he just isn’t that good. The Lions are never winning a Super Bowl with Stafford under center. He does not step up in big games and displays incredible inconsistency. He might have a few dazzling games here or there but on the whole, he is a largely average quarterback who has a durable enough arm to throw the ball 600 times a season. On the whole, Stafford just doesn’t cut it. Stafford’s big yardage is jaded. No one takes into account that he attempts 100 more passes every year than most QB’s with the exception Brees, Manning and 1 or 2 others. At a 60% completion rate and 10 yards per carry you can subtract about 600 yards from those big numbers. This is with atop notch receiving corp all of his career. Heck, Jon Kitna used to get 4400 yds. In Detroit. Good read!! I cant agree with you more! And i believe Derek carr will follow this guys foorsteps.. Mediocre at best! The jury is still out on Carr. Give him until after Year 3 to make that judgement. But to your point, it wouldn’t surprise me either.